Posted on March 18, 2013	by . Giving your kitchen a facelift does not have to cost an arm and a leg. You don’t have to do a total renovation or replace everything in your kitchen. You can even use the same cabinet fixtures but spruce them up a bit to create a new look. Here are some budget friendly tips on how to revive this part of the house. If you have an open layout, you need to pay special attention to your counters. These will be the most visible part in an open concept kitchen. Many homeowners use marble tops or granite. These choices are quite expensive and require a lot of maintenance. If you prefer to have a stone finish on your counter-tops, consider using quartz which comes in a variety of colors. This material is virtually indestructible and will last a long time while it produces a high quality finish to your kitchen counter. Another option is to use concrete and have the surface stained or colored (see video below). Chemical stains, pigments, epoxy and a number of aggregates can add texture and class to ordinary cement surfaces. They can look like granite, marble, or limestone but will last longer than any of them. 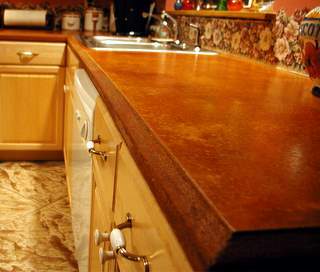 Using concrete is also cheaper than buying granite or marble slabs for your counter-tops. You can also use the same material and technology for your kitchen floors. Cabinets don’t have to be removed and replaced to create a new look. If your cabinet materials are still in good condition, you can have them resurfaced or repainted. So, instead of replacing the entire cabinet fittings, you can just get new hardware such as modern stainless steel knobs and drawer handles. Before repainting kitchen cabinets and drawers, make sure that the doors and fittings are realigned properly. Use color to freshen up things. If your old kitchen appeared dull and boring in white or beige, repaint the room in two tones with one color in a vibrant or eye-catching shade. Use an accent wall to break up monotony. You can also reupholster or repaint kitchen furniture in attractive colors. Add some artwork on the walls to provide some character and pizazz. Making your kitchen look beautiful does not have to be costly. You should also consider the durability of the materials you will work with. It can become expensive to have to redo your decor again after a year or two if your materials don’t last long. Talk to a good interior designer or hire a reliable contractor to apply your own unique design. LIKE us on Facebook for more home design tips and information about Bacolod City real estate. This entry was posted in Centrale Bacolod, Real Estate Tips and Advice, Video and tagged Bacolod City Lots for Sale, Centrale Bacolod, Centrale Bacolod Video, centrale lots for sale bacolod, Home Design Tips, Lots for sale Bacolod, Real Estate Tips and Advice, Video. Bookmark the permalink. Awesome video! will try this at my office. Hi you have a nice weblog over here! Thanks for posting this interesting stuff for us! If you keep up the good work I’ll visit your blog again. Thanks! Wonderful kitchen remodeling tips. Remodeling of kitchen cabinets ensures great design and produce a great look towards your home. Wow great! nice Home Design Ideas i will try to this our work. Wonderful idea. Kitchen renovations increase the value of your home as well as it helps to be feel more comfortable.